There’s something about a Metroid-Vania style game that intimidates and turns me off. Maybe it’s the reliance on save points or the lengthy backtracking, but just the thought of losing progress is enough to give this reviewer anxiety. Even the beloved and renowned Dead Cells couldn’t hook me like it did so many others. Which is why I didn’t have much hope for Chasm, developed by Bit Kid, Inc and recently arriving on Xbox One. After watching the launch trailer I was intrigued, but didn’t immediately see something that set it apart. It turns out that Chasm is exceptional in just about every category a game can be rated. Anyone with the slightest interest in the genre should just stop reading now and buy it. You play as a new knight recruit, eager to prove his worthiness to the throne. You receive word that a mine the Kingdom relies on has been shut down and set off to investigate. You discover that the mining town is practically barren, as residents have disappeared and creatures have been spotted in the mines. What begins as a simple exploration and rescue job quickly escalated down a windy path deep underground. Your motivations are simple but believable, and they work great for this setting. From the opening moments, Chasm brought back happy memories of the original Metroid (basically the one game in the genre I enjoyed). You have enemies that respawn when you return, vertical platforming, areas you can’t access without an ability and even a static elevator ride paying homage to the 1986 masterpiece. Your map unfolds with each new room you enter, thankfully it’s easy to see doors you haven’t been through and whether there are any chests inside. You can set a marker to remind yourself of a particular room, but with no way of labeling or distinguishing it further, I had a hard time remembering why I marked certain rooms. My main character moved freely across the world, using pressure sensitive jumps to reach new areas and the ability to wield both melee and magic weapons. Melee weapons can be found in chests, dropped by enemies or purchased/crafted in town. Each one has it’s own stats for damage and will likely increase or decrease your stats in other areas such as luck, critical hit chance, etc. Each handles and feels differently, you might have a huge golden hammer that does 70 damage, but the overhead swing is far slower than the officer’s sword, which swings faster but deals less damage. Thankfully you can carry as many weapons as you like and utilize their strengths for the given situation. Magic abilities vary but usually come in projectile form (Molotov, boomerang, shuriken, knife) and can be upgraded in town by trading in the jewels you find. 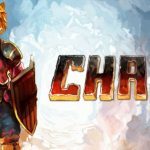 Veteran players will feel familiar with Chasm’s HP, MP and XP systems. Eating food or saving will replenish your health, smashing light fixtures can reveal magic orbs and defeating enemies increases your XP until you level up. There are a few equipment slots for things like helmets, rings, belts and armor. Naturally these have varying stats as well, and you will want to have a few different types on hand to feel fully prepared. Easy to read red and green arrows let you know whether something is stronger or weaker in a given area; all these mechanics are straight forward and work well. As you progress, new abilities like: swimming, ledge hanging, wall jumping, double jumping and more are discovered. Many times I knew exactly how to reach an area, but I just lacked the ability. I felt genuine giddiness when I could reach an inaccessible area for the first time usually discovering a new section of the map or cool item. A lot of Chasm relies on your remembering areas you must return to. The game lacks any hint system or guide to help keep you onto your next objective. There were a few times where I felt stuck and had to search online for things like “how do I learn to swim?” There is a fast travel system in place that helps ease the burden of backtracking. Each area has a main portal that can allows travel between levels to be quick and easy. Nevertheless, like all games in the genre there are ample amounts of backtracking. 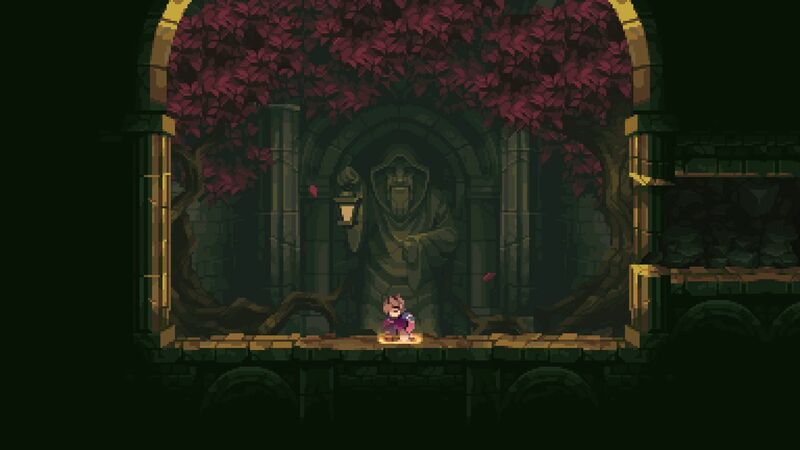 Chasm has quite a few long corridor areas which can feel monotonous when stronger enemies block your path. Thankfully every enemy defeated adds to your XP and killing a certain number will add them to your Bestiary. Rescuing trapped villagers and then completing their sidequests in town will unlock their ability to help you or earn you a useful item. Bring a set amount of flour bags to the baker and she can create health replenishing treats. Gather enough platinum bars for the nerdy scientist and he will give you a secret detector. The blacksmith will craft items out of the elements you discover like: iron, silver, gold and platinum or you can sell them for spending cash. These quests are always worth prioritizing and never caused me to feel sidetracked or inconvenienced. Each area has its own boss battle, which typically rewards you with a new item or ability you need to progress. Chasm has a few difficulty options, which means that while I hardly died playing on easy, I had fun the entire time. Players who are into that sorta thing can up the resistance to get their fix. Presentation wise, Chasm has a sprite art style reminiscent of a Super Nintendo game. Each area is defined by distinct visuals, from the lush greens of the garden to the dank and dark rooms of the Keep. There are literally no loading times between areas and the music is both fitting and enjoyable to listen to for extended periods of time. There was no slowdown during intense moments of combat and quitting out and reloading a save was done in mere seconds on both Xbox One S and X. Kudos to Bitkid on a high-quality Xbox port. 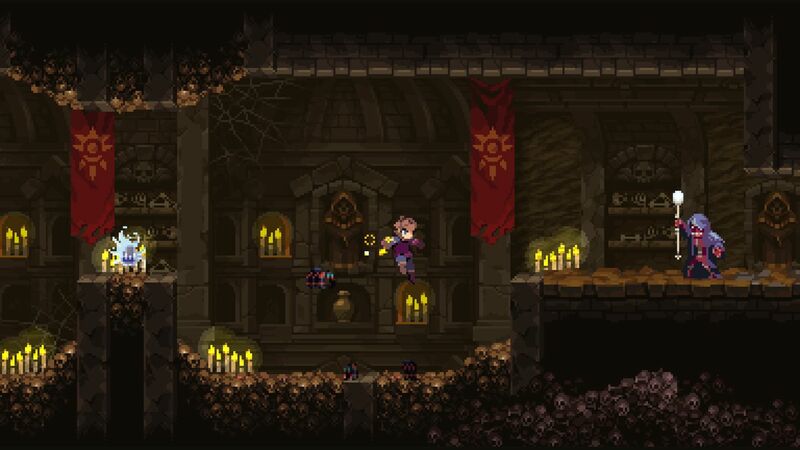 There is an overwhelming list of things I loved about Chasm that finding a couple faults just feels like nitpicking. Ledge jumping takes some getting used to, in the beginning I felt like my character didn’t latch on properly every time. Your character’s look also doesn’t change when you equip new gear, but don’t let these deter you. 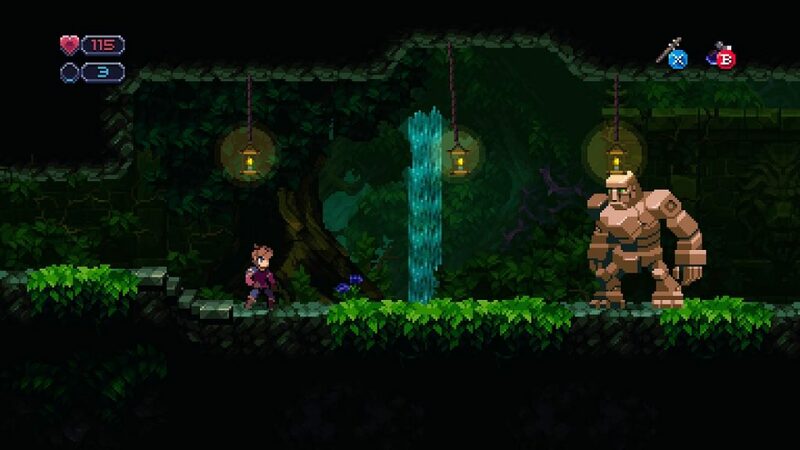 Chasm is a fundamentally-sound and engaging “Metroid-Vania” adventure. It took me about 10 hours to reach the end on easy difficulty with thorough backtracking and save file close to 100%. There are 20 achievements on Xbox One, and I’d guess most gamers can realistically earn 16 without too much trouble. I have no issues with the price of $19.99 and would even pay more for DLC to play a new area or side story. Both genre fans and non-fans owe it to themselves to check out the mines of Chasm for themselves.